For over 43 years Larry V. Bishins, has built a strong foundation of providing individuals and businesses with the highest quality representation and counsel they need to overcome their legal issues in taxation, business and estate planning. Larry V. Bishins successfully devises and implements timely, comprehensive and tailored plans for clients that meet and solve their problems before cases become serious. As a testament to Larry V. Bishins' commitment to delivering exceptional client service, he has earned an AV Preeminent Peer Review Rated by Martindale-Hubbell listing, the highest recognition possible in the legal industry, for his professionalism and ethics. There is no substitute for an experienced attorney: Dealing with the Internal Revenue Service (IRS) and aggressive tax collection agencies can be akin to living a nightmare. But you don't have to do it alone. 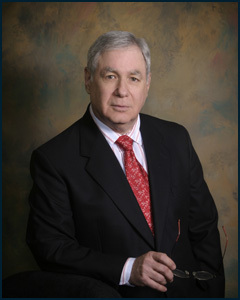 As a Board Certified Tax Attorney, Larry V. Bishins has over four decades of experience vigorously representing clients against the IRS and provides tax resolution services that include IRS audits, IRS collections, IRS liens, IRS levies, IRS appeals, and tax litigation in U.S. Tax Court, the U.S. District Court and the U.S. Court of Federal Claims. Larry V. Bishins also advises clients as to both inbound and outbound foreign taxation. Whatever a client's legal concern, the law firm of Larry V. Bishins, has the seasoned trial and negotiation skills to help in the areas of: -Taxation law -Business and corporate law -Wills/trusts/estates/probate A law firm providing active and enthusiastic support: While Larry V. Bishins' experience enables him to attack even the most complex cases fearlessly, he is also aware that for many of his clients, confrontations with the IRS can be intimidating and stressful. He clearly explains the law without complicated legal jargon, patiently listens to his clients' concerns and regularly communicates with clients about the progress of their cases. From the initial consultation to the final resolution, Larry V. Bishins is the pillar of strength who helps clients rise above the storm. Owing taxes to the government can cause serious problems for your family, your business and your future. The government is entitled to collect what it is owed, and it can seize your bank accounts, your wages and your business assets. In certain cases, it can even seize your home. When individuals and businesses in Florida are in trouble and need immediate assistance with their taxes, they turn to Larry V. Bishins in Fort Lauderdale. Larry V. Bishins has been known for providing clients with top quality legal representation for more than 41 years, and he stands ready to help you get the best possible results in your case. Fort Lauderdale taxation attorney: Larry V. Bishins represents clients in Florida and across the globe. His practice focuses on the following areas: -Tax planning -Tax litigation and representation -Tax return preparation -Estate and gift tax returns -Sales tax audits -Income Tax Audits -Estate Tax Audits -Offers In Compromise -Removal of Liens and Levies -Administrative Appeals -Collection Due Process Appeals -Inbound Foreign Tax Planning -Outbound Foreign Tax Planning -Penalty Abatements -Wage Levies Larry V. Bishins is a highly trained professional with the experience and ability to handle even the most complex cases. He takes a common sense approach to your case, running the numbers and analyzing every detail to find effective solutions to the tax problems affecting your finances or business. This method has helped clients throughout Florida successfully resolve tax issues, including audits and litigation involving the IRS and other tax agencies. With a proven record of results and a steadfast dedication to excellence, Larry V. Bishins is the name clients trust to deliver relief from their taxation problems. A legacy of excellence in state and federal tax cases: Larry V. Bishins knows that time is money. The firm acts immediately to protect your finances. The firm seeks to stop any filing of any levies against you and works to negotiate payment plans with your best interests in mind. Larry V. Bishins zealously defends your rights in court and in front of tax agencies, and he works to ensure that your assets are secure now and in the future. -The Greater Fort Lauderdale Tax Council, Inc.
-Estate Planning Council of Broward County, Inc.
-Member of The One Hundred Club of Broward County, Inc.